Get all new articles directly to your inbox! Dealer Dan, pictured here with WWE Superstar Mick Foley, has been in internet marketing since 1996. He likes hugs, long walks on the beach, and making money while wearing his jammy jams. For more information, you can read all about Dealer Dan. AffiliateBible.com » General & SEO Affiliate Guide » Do You Update Your Articles? Do You Update Your Articles? It’s no secret that content is important in the affiliate world, yet I see the same mistakes made again and again; affiliates focus on new content, and are worried about getting updated content to keep google visiting their site on a daily basis. What about that existing content? Seriously, what about that existing content on your website? When Full Tilt launched Rush Poker, I’m sure you wrote about it on your website. Have you went back to update that article? How about when Sun Poker moved to the iPoker Network? Did you write about that happening? And have you went back to update that article since? Or updated any other Sun Poker articles to make them relevant? How about those beginners articles you wrote on getting started in online poker, and what poker rooms to try out? Have you updated them recently? Or that strategy article talking about how to beat micro-stakes NLHE games? Have you went back to update that? Write a bit about how things have changed since then? Date is important. If you have a date published on a website, it’s usually in a prominent place, and is one of the first things visitors see. Yet it’s something that people don’t think about. People list the date on pages they add to their website because – well, usually because it’s there by default in the WordPress theme that they are using, and they just haven’t bothered to change it. Yet they don’t realize just how big a turn off this can actually be to the web visitor. If you have dates on any of your articles, have a look at time-based search phrases, and what that specific visitor does. For example, as I write this article it is currently Easter, “Good Friday” to be exact. April 2nd, 2010. Lets say I am a government worker, off for the weekend, and have a weekend ahead of family dinners and not much time to myself. I’ve just pasted a snippet of the full 409 word article. You see the problem here though, right? The first thing you read is “Easter Promotions at Casino Tropez”. Excellent, you say! This visitor has found what they are looking for, and this should be an EASY conversion. Except the next part, which mentions the date as April 9, 2009, completely negates the whole point of the article. The visitor is not going to sit there and read 409 words about LAST years promotion – they’re going to close that window, and check out other google results, and the webmaster has just lost a conversion. #1: Remove The Date: Not the most visitor-friendly solution, but it works. By removing the date, the visitor will think the information is relevant to them and click through. Now while Casino Tropez may not be running the same Easter promotions, they may still be running some other promotions that are able to hook the visitor. #2: Do Nothing: Leave it up there, out of date and turning off visitors because hey, google loves content right? And maybe they will even get a click-thru or two out of it. Maybe the web visitor will click a banner, or the “Casino News” tab to see if there is any updated casino news. There’s nothing wrong with leaving it as it is, however it decreases the chances of a conversion drastically. The visitor is looking for easter promotions – so give them easter promotions! Make it simple for them – don’t make the visitor have to work. K.I.S.S. #3: Update The Article:: This may seem like the most common sense approach – simply update the article. 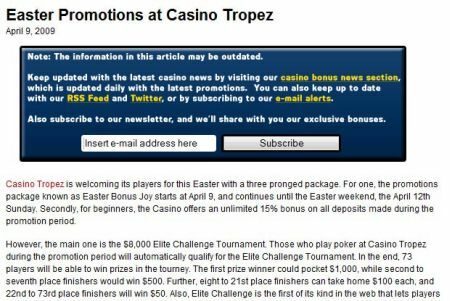 Either update the article with any CURRENT Casino Tropez Easter promotions, or link to articles promoting any easter promotions being run by casinos in 2010. However this can take a lot of work, and you really don’t want to be spending your time updating your “Full Tilt Christmas 2007 Bonus Promotion” article every time December rolls around. This is where widgets like “Related Posts” and “Latest Posts” can come in handy. Some people like to bury them on the site, or at the end of an article. But in this instance they should be given prominence, and should be one of the first things the visitor sees. They are also dynamic, so you can install them in your theme, and even set it to only show on articles that are over x days old. Now what happens when the visitor comes across the webpage? Rather than see the date and thus close the page, they’re presented with a variety of options. They can click through to the casino bonus news and see what the latest bonuses are. You’ve also given them options to subscribe to your site via RSS Feed, Twitter or e-mail, and once you’ve got a visitor subscribed, it’s a lot easier to convert them(and determine how to convert them). Any of the above solutions will help convert visitors that would otherwise find an outdated webpage and close it. Now we’ve talked a lot about visitor optimization but how does this affect search engine optimization? It seems more and more people care about pleasing the almighty Google than their visitors, so how does this please the search engines? Well more and more, Google and other search engines are focusing on real time search. There’s a simple reason for that: when it comes to news especially, people want recent articles. If I’m searching for casino easter promotions, I clearly don’t want any in 2009. Google isn’t going to want to serve those to the searcher. So by keeping pages updated, it gives Google more incentive to list and rank those pages early, as they may be helpful for the visitor. Furthermore, what if the visitor went to the webpage, saw it was an outdated article and immediately closed it? What if Google is able to track that, via Google Toolbar, Google Analytics, Google Chrome or one of the other 8 million Google Apps available? They’re going to look at that and say “this page doesn’t help the visitor” and possibly drop it down the rankings. What’s worse is it could affect your site as a whole. If Google notes a trend of people visiting and closing outdated news posts within seconds, don’t you think there’s a potential for that website to drop in value? This doesn’t apply to just news sites – it should apply to everything. Everything else being equal, I’m sure Google would rather serve the visitors a poker room review written in January 2010, than a review written and not updated since 2006. You don’t even have to spend a lot of time on this. 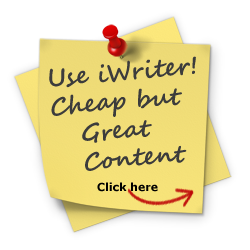 Find a method to updating articles that suits you. For example for Casino Answers once a week I sort the articles by word count, pick out 10 articles with the lowest word count – then add a paragraph or two to them. Simple as that. Takes me about 20 minutes, and I’m updating content, optimizing it for the visitors and for the search engines, and adding value to my site in the process. I use the WordPress Word Count Plugin for that. Spend some time over the next week looking at older articles that are still getting hits. Put yourself in the visitors shoes, and ask yourself: could I update this article and increase my conversions? This article, as are all articles on AffiliateBible.com, was written by Graeme aka "Dealer Dan". Graeme currently resides in Kingston, Ontario and has been running his own internet marketing business since 1996. This article was written on April 2, 2010 however all articles are looked at on a monthly basis and updated to keep them relevant. If you need to contact Graeme, please see his Contact Page. If you are an affiliate manager wanting promoted please see this page. If you want Dealer Dan to promote you on his network of sites, please see this page.